For a long time, it’s been easy to describe Milestone games as serviceable at best. Games about the two-wheeled mode of racing have never been at the top of the pile. Milestone S.r.L’s own Ride 2, which I scored 7.5/10, is likely the best motorbike racing game available and still not exactly great. This looks to have changed with a game that totally caught me by surprise. Last week I was able to attend a preview event of Gravel and Monster Energy Supercross at Milestone’s studios in Milan. Gravel I was expecting to be good. Monster Energy Supercross, however, I wasn’t going into with high hopes. I’ve found the MXGP series of games to be average at best and often barely an improvement on each other. Our own Kai Powell may disagree with that assessment. Without any shadow of a doubt, Milestone have seen a marked improvement in their releases as time has gone on. 2018 also marks the first full year where, rather than using their own in-house engine, they’ll be making use of Unreal Engine 4. Having first made use of it with the aforementioned MXGP3, enough time has passed with a few releases, giving the company experience with the engine and the ability to utilise it to a better level. This shows immediately. With the hands-on time I had, I could see an immediate improvement in visual fidelity. The version I played ran fantastic and at a smooth 60fps. Most important, it’s absolutely spectacular while racing around, especially so in first person mode. I will say that this is a bit too challenging though, I ended up opting for the third person view as I always do in racing games. Watching the replays though, you’d be well within your rights to think you’re just watching a showing of the event. Albeit one of the best crashes in Supercross history. What really helps is just how much variety you have at your fingertips. Everything you can think of is customisable. Your rider and everything from their helmet to their gloves and boots have a wide variety of makes. The clothing, much like the bikes and the components that can be equipped to them, are all officially licensed brands. Aside from a select few special items, which are earned through reputation gained in-game, all items can be bought using the in-game currency. Yes, not a single loot-box in sight. As well as looking that much better, there’s a lot to say about how Monster Energy Supercross feels. Being a motorbike rider myself (albeit not an offroad rider), I can at least offer an appreciation for the handling of the bike. I would agree with Milestone’s statements that it’s the most realistic they’ve had the bikes. Of course, you’ve still got that leniency on easier settings and with more assists. This will be clearly visible in my gameplay footage. Turn them off and you’ll certainly see your rider heading to the emergency room. 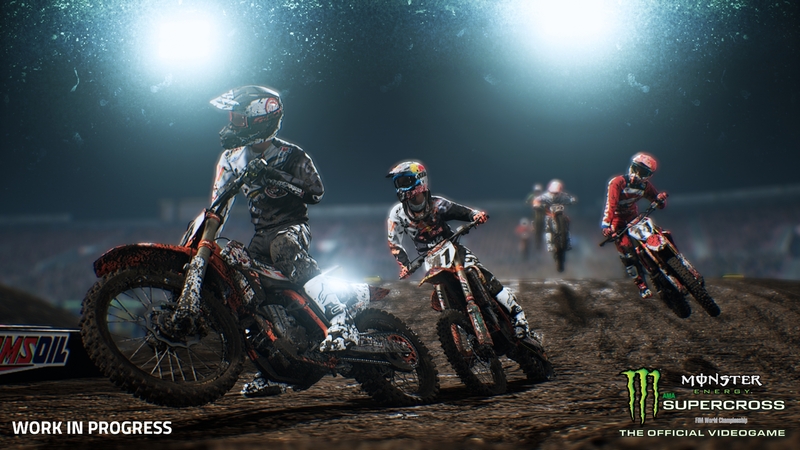 As well as racing on official tracks, Milestone S.r.L have set Monster Energy Supercross apart with one other, excellent, feature. This is the track creator. During the event, I must have spent one hour creating a course which I dubbed “Hellscape”. I then tried out my track and realised that I had made the course that would end lives. Took a few of the impossible bends out and had the four other journalists and a few Milestone employees playing “Hellscape 2.0”. It went down a treat as the course flowed surprisingly well, but offered a challenge. This is what will likely boost Supercross to that next level. The track creator is incredibly well realized. Start by picking a stadium size to work from. Then you’ve got free reign – within reason – to create your track using a large variety of jumps, turns, bumps, bridges and more. This, combined with the online mode, could see Supercross with a following that surpasses that of the other Milestone titles. Supercross will have a strong challenger in Gravel, however. Both are by far Milestone S.r.L’s best titles to date. I’ll be writing about Gravel very shortly. For now, feel free to watch the gameplay footage I captured from the event. 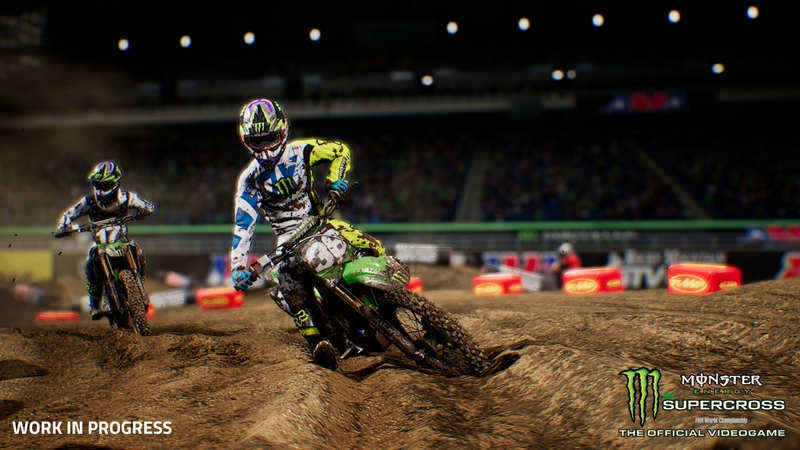 I’ll finish by saying roll on February 13th, which will see Monster Energy Supercross release on the PC, PlayStation 4, Xbox One and Nintendo Switch.